It might have been just another political stop, a timely bit of outreach to the African-American voters who could be key should she run for president. But then Warren shifted her focus to Matthew 25:40 — and Jesus. Warren is well known for her acrid take on Wall Street money power, on the Trump presidency, and on all the forces in American life that, in her view, deny equal opportunity to all. Much less well known is Warren’s relationship with God. “She’s a praying woman. . . . She believes in prayer,” said the Rev. Miniard Culpepper, pastor of Pleasant Hill Baptist Church in Dorchester, who met Warren during her 2012 campaign. He recalled how he prayed with Warren and her husband, Bruce Mann, at her request, before every debate in her race against Scott Brown. Culpepper joined her again in prayer just before she took the stage to give her speech to the 2012 Democratic National Convention in Charlotte, N.C., the biggest moment in her fledgling political career up to that point. “She also believes in the Word of God, and wants to live according to the biblical teachings,” he said. It’s a relatively private side of Warren that would almost inevitably become more public if she decides to run for president. Warren says she is squarely focused on her Senate reelection race. Warren’s religious background is a minor theme in the two political books she published since taking office. She was raised Methodist in a conservative Oklahoma town, and writes about taking her children to church most Sundays and teaching Sunday school during her years as a young law professor in Texas. She recounted using the Socratic method to teach her fifth-graders their Bible lessons. 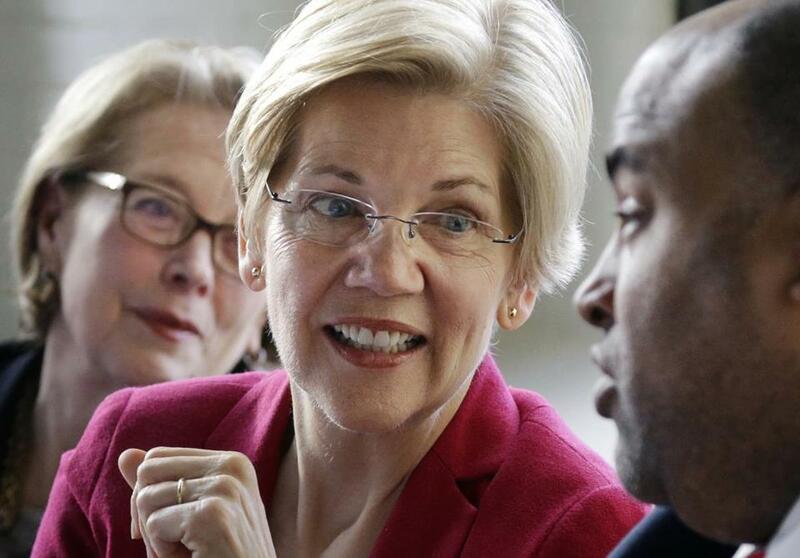 Back in Boston, Warren, who declined to be interviewed for this story, doesn’t have a home church she regularly attends, but she frequently visits a variety of houses of worship — including many African-American churches — around the state, particularly in Boston, according to local religious leaders and aides. 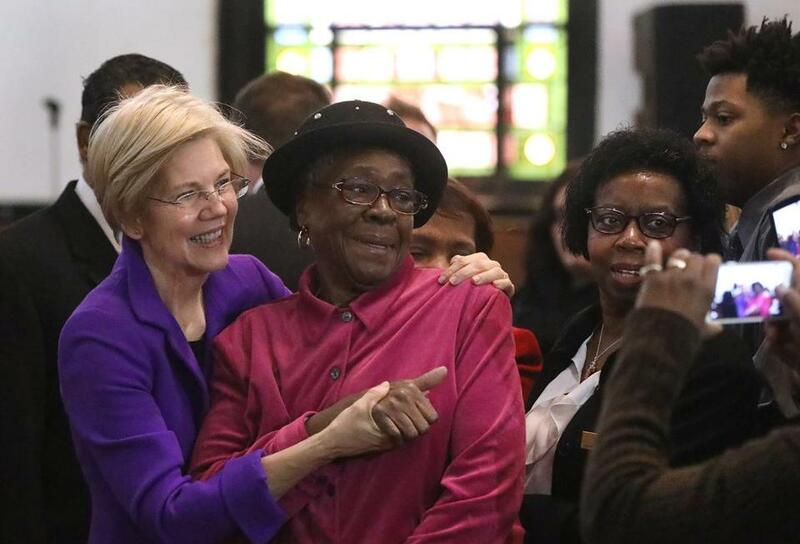 Warren greeted congregants during a service at the Columbus Avenue African Methodist Episcopal Zion Church in February. Most recently, she visited Jubilee Christian Church in Mattapan on the first Sunday in August. The visits are almost never publicized. She carries her own Bible with her, pastors say, a well-worn King James version she has had since the fourth grade. “We sort of consider her a member,” said the Rev. Jeffrey Brown, an associate pastor at Twelfth Baptist Church in Roxbury, because she has been there so many times. Warren displayed her familiarity with the Bible during her Aug. 28 appearance at Ebenezer Baptist Church. She was there as part of the King Center’s “Beloved Community Talks,” and her roughly 30-minute conversation with Bernice King, the civil rights leader’s youngest daughter, quickly turned from her trademark political themes to faith. When King asked about the ability of the country to bridge its vast partisan divides, Warren responded with a parable Jesus told of God dividing people into two groups, as a shepherd divides his flock into sheep and goats. The sheep are going to heaven because they fed the hungry, ministered to the sick. When King responded that she’s been struggling with Jesus’s admonition in Matthew 5:44 to “love your enemies . . . do good to them that hate you,” Warren jumped in with her take on that teaching as well. “It’s not a Scripture about being passive. Its not a Scripture that says lay back and just let hate roll on through,” Warren said, leaning back in the blue armchair she was seated in, then sitting back up. “Its a Scripture that says do good. It’s a Scripture that says act. It is a Scripture that says make your love strong. It is a Scripture that says — to me — raise your voice, make sure you are heard,” she continued, jabbing a finger with each word. Warren’s affinity for the Matthew 25:40 verse is evident in her public statements and writings. She quoted the verse in her 2012 DNC speech, linking it to the legacy of the late Senator Edward M. Kennedy, whose former seat she was trying to wrest back from Brown at the time. In her 2014 book, “A Fighting Chance,” she writes about discussing her “favorite Bible verse” and what it means to her with Culpepper’s congregation at Pleasant Hill at a very tough time during the 2012 campaign. “She refers back to that [verse] repeatedly as a guiding principle for her life,” said Brown, the associate pastor at Twelfth Baptist Church. She also turns to it in less public settings. A year or two after her election to the Senate, the Rev. Jim Wallis, president and chief executive of Sojourners, a liberal magazine and Christian social justice movement based in Washington, invited her to address a leadership summit his group hosts every three years. Matthew 25 was the text about which she chose to speak. “And she really preached,” said Wallis, for whom the passage is also personally meaningful. “I’ve heard a lot of sermons on Matthew 25. I’ve preached a lot of sermons on it, and it was good. She knew the text, knew the context, knew what it meant, she interpreted it very well,” making it relevant to the current moment but not political, he said. “It was very much a Christian talking to other Christians,” said Wallis, who first met Warren when she was a Harvard law professor. He also remembers being struck by the sight of her Bible as he watched her open it on the podium as she started her talk. It was full of underlined passages. “It was clearly a Bible that somebody had been reading for a long time,” he said. Other religious leaders interviewed for the story likewise described Warren as authentic in her religious activity, and not a politician who talks of faith because it is politically opportune to do so. Brown of Twelfth Baptist Church, the former leader of the Boston TenPoint Coalition, said he’s known a lot of politicians over the years and had many come to his church. Victoria McGrane can be reached at victoria.mcgrane@globe.com. Follow her on Twitter@vgmac.